Have you ever had a family heirloom…. 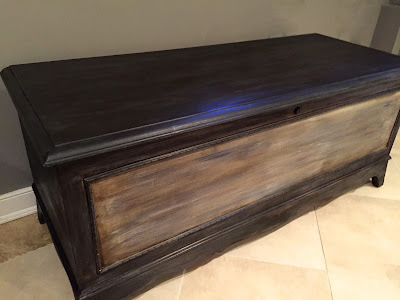 My client, Nancy, had this Lane cedar chest. She hated the way it looked. Plus it had a big water mark on the top. it had been in her family. Here's what I did to transform it. Annie Sloan Chalk Paint on that front section. I started with Country Grey. Then layered with French Linen. I wanted some of the wood to peek through. Next, I used Maison Blanche in Navy. And then buffed til it glowed. Here it is in her newly decorated basement bedroom. Where it blends just perfectly. Have a piece you can't part with? I can help you love it! !